Welcome to the Populous Wiki, a resource full of information about everything related to Populous. You will find many strategy guides, hints, tricks and tutorials on playing or editing Populous. Everyone can help extend the wiki by adding or editing articles, for more information see Wiki Help. If you have your own website related to Populous then please link to this resource and then add your website to the links section after logging in. Christmas: The mappack NW20: Christmas Worlds is unlocked during december only! Also, christmas skins on some TB levels! Anniversary: Populous 20th birthday - November 2018! Some of the Bullfrog members were on Popre's discord and matchmaker! Campaigns: Community campaign released. Forge of Fates is now available to play! Matchmaker and game: New features, such as game betting system, new achievements, and new web design being made. MP SP: Single Player is now integrated on the Matchmaker! Tornado destroying a settlement. 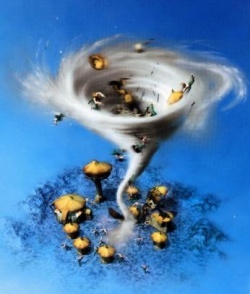 Image from Italian version of Populous. Anyone can help create and edit pages for the wiki. We are trying to get everyone involved and create professional articles about anything related to Populous. If you need help please see the Wiki Help page for more infomation about editing the Populous Wiki. If you need ideas goto Wanted Pages. Note: All experienced players can write strategies and tips for any level that has been made, from Single Player levels to mappacks. This page was last edited on 27 November 2017, at 15:49.